The Treasure Coast Exchange Club recently recognized Marine Bank & Trust for its leadership and impact on the community. 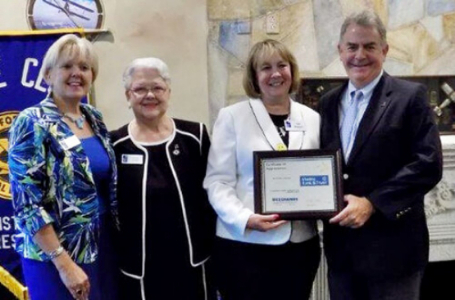 Additionally, vice president and banking center manager Kim Prado was singled out for her many contributions to the community during the June 21st Treasure Coast Exchange luncheon at CJ Cannon’s Restaurant in Vero Beach. Marine Bank’s leadership team, including president & CEO Bill Penney, Mary Cone, residential/consumer lending vice president; Georgia Irish, business development/client services vice president; and Kim Prado, banking center manager/vice president was honored for co-chairing the United Way of lndian River County’s 2017-18 Annual Campaign. The Bank was also recognized for encouraging employees to become leaders resulting in personal development and growth. In addition to serving on the United Way board and various committees, employees have actively volunteered with numerous local organizations, including the Alzheimer & Parkinson Association, American Cancer Society, Board of Realtors, Environmental Learning Center, Habitat for Humanity, Healthy Start Coalition, Hibiscus Children's Center, IRC Chamber of Commerce, March of Dimes, Ocean Research & Conservation Association (ORCA), Oceanside Business Association, Treasure Coast Builders, Vero Beach Air Show and Youth Guidance. Few people set a better example of stepping up to leadership challenges than Kim Prado who received the Book of Golden Deeds in recognition of her dedication, leadership and many contributions made to our community. On July 1st, Kim will become the President for the Florida District Exchange Club. In addition, Kim chartered and continues to serve as a leader, mentor and board chair for Pathfinders Youth Guidance EXCEL Club, a club that has been recognized by the Florida District as the EXCEL Club of the Year in 2015 and 2016. The Exchange Club of the Treasure Coast is an all-volunteer group of business professionals who support and advance the Exchange's programs of service including: youth, Americanism, community service and child abuse prevention. The club’s activities are designed to meet the needs of the local community in Indian River County while developing leadership, networking, and organizational skills that contribute to success in business, family and personal endeavors. For more information, please visit www.tcexchangeclub.org.